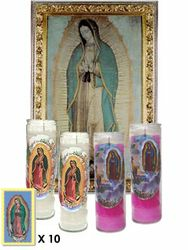 This package contains one (medium poster: 36" x 21") image of Our Lady of Guadalupe, 2 white candles, 2 pink candles and 10 Our Lady of Guadalupe stamps. This package is an ideal gift to your mother or for your self in any occasion. Mothers Day in the US is supposed to be the second Sunday in May, but Mexico celebrates it on May 10 (Dia de las Madres). Why? It seems to be special to Mexico, and is celebrated with a mass at the shrine of the Virgin of Guadalupe, where an orchestra plays "las ma�anitas" of the Virgin. It is a moving event, with the old-fashioned celebrations which are so much more gracious (almost religious) than modern ones. This is not the Virgen of Guadalupe as a symbol of Mexican nationalism, but the Virgin as the symbol of motherhood. On January 25, 1999 Our Lady of Guadalupe is pronounced to be The Patron of the Americas. The great importance of this event is highlighted further as His Holiness John Paul II declares himself devout to Our Lady of Guadalupe and proclaims his followers to do the same. On this same day The Pope blessed the digital file of the sacred image, which was previously commissioned by the Archbishop of Mexico, along with 84 prints created from this digital file. One of these very special copies now resides in the courtyard of the Cathedral of Our Lady of the Angeles in Los Angeles, California. Este paquete incluye: Una imagen mediana de la Virgen de Guadalupe, 2 veladoras blancas, 2 veladoras rosas y 20 estampas tama�o credencial. Le ofrecemos por tiempo limitado reproducciones exactas, al tama�o real, de esta venerada imagen, bendecida por su santidad Juan Pablo II y certificada por el Emmo. Cardenal Norberto Rivera Carrera, Arzobispo de Primado de Mexico. La imagen ha sido reproducida a partir de un archivo digital extraido de la original en 1999, con las mas modernas tecnicas de impresion y los mejores materiales para garantizar su maxima fidelidad.